Symbols*: The octopus swims beneath a moonlit ocean. It carries a cup in each of its tentacles. Its movements are growing erratic and disorganized. It is tipping all the cups every which way as it desperately tries to break its treading pattern. It seems to be swimming in places as fish wind between its tentacles in an organized fashion. The fish are swimming to the surface, where lunar energy will bask them with insight and the power to activate dreams. The octopus is trying to absorb the energy of the moon but is unable to embrace the radiance in a manner that will enable it to move forward and see the future more clearly. Description*: Too much rigidity has left you feeling stagnant. You are repeating old patterns of behaviour and are becoming drained and uninspired as a result. You have overextended yourself and are now confronting the reality of not being able to realize your initial goals. Take a breath and let go of the extraneous elements in your life that are restricting your ability to move forward. If we work continuously, without standing back for an objective view of our progress, we run the risk of rendering ourselves exhausted and unhappy. Possible Meaning: Again, I don’t agree with the negative way of thinking (of interpreting this card) but rather a positive thing; everything can be turned into positive if you’re willing to see it. The number eight is important - eight is the number of power. Octopus shows us how to get what we want in an intelligent and efficient way. You can accomplish more than the average person in the same amount of time. However, remember to take care of yourself along the way. Thoughts/Points to Ponder: This octopus looks like she’s having fun, she seems to be laughing; almost as if she was high/drunk on life itself. The sun is setting, it is time to forget the old and be prepared for the new. Remembering this day as a good day, even if challenges were at present, they’re there to teach us a lesson, hence positive thinking. Each day is a new chance. 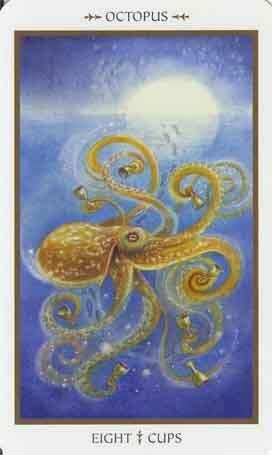 Related to the spiral of life, Octopus is reflective of the mystic center and the unfolding of creation. Octopus people usually have good memories. The number eight is important - eight is the number of power. Octopus shows us how to get what we want in an intelligent and efficient way. You can accomplish more than the average person in the same amount of time. However, you must be careful to care for yourself while you are working. Housekeeping is not a strong point with Octopus totem people.